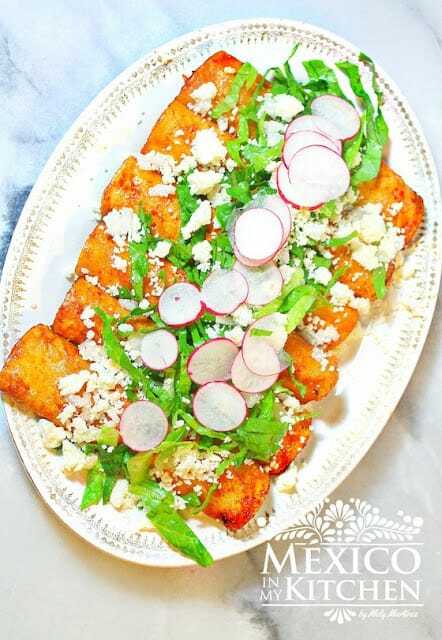 Enchiladas Rojas is one of those dishes that are cooked differently in every home. Each cook has his/her own recipe, so this is my own version based on my mom’s way of cooking them. In my hometown, it is common to have enchiladas for breakfast or brunch and served with a semi-dried salted meat known as “Cecina”. They are topped with crumbled fresh cheese and chopped white onion. 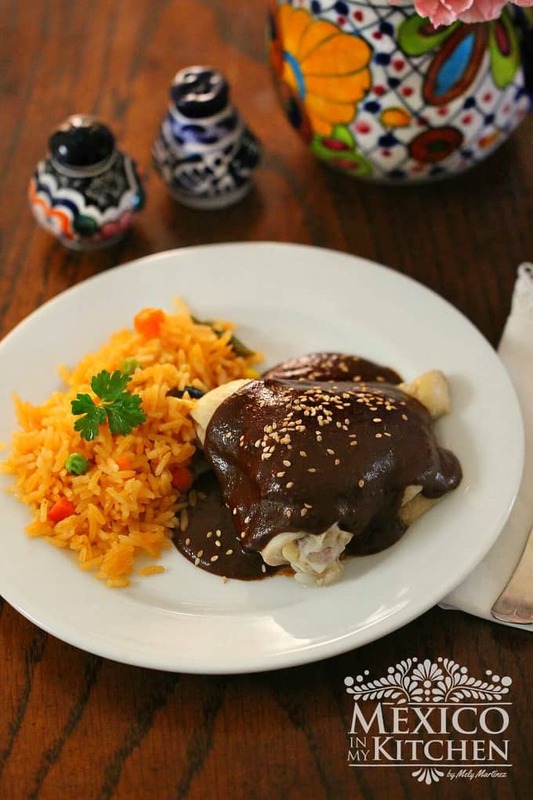 This plate served family style has a variety of enchiladas with green, red enchiladas, tomato, mole, bean, pipian enchiladas, and cream salsas. Served at the restaurant “El Huasteco”, in my hometown Tampico, Tamps. Now, Enchiladas Rojas can be made using many different types of peppers, with spices or without spices. In México there are a handful of dishes known as ‘EnchiladasRojas’, like the famous ones from Zacatecas using only Ancho Pepper. My favorite is the ‘enchiladas placeras’ sold at the plaza in Morelia, Michoacán, with a side dish of cubed carrots and potatoes.
. Some just fold the tortillas in half and others roll them up using shredded cooked chicken as a filling. This is my mother’s enchiladas rojas recipe. You can play around with a number of peppers, using more ancho peppers than guajillo or even making the enchilada sauce using just one of the peppers in the recipe until you find the taste that you and your family enjoy better. Remove saucepan from stove and let them cool, drain the peppers and place in the blender along with the garlic cloves. Add 1/2 cup of clean water and blend until you have a smooth sauce. Season with the oregano, salt, and pepper, and set aside. Preheat your oven to 350 degrees to keep the enchiladas warm while you finish assembling them. Add the 2 tablespoons of vegetable oil in a large skillet over medium heat. Dip the tortilla into the sauce. Place it in the Frying Comal-pan or skillet and briefly fry a few seconds on both sides. Place fried tortillas in a dish. To assemble the red enchiladas, place the filling in the center of the tortilla and fold it. Sometimes I place a meat filling into the center of the tortilla and then roll it, like in the pictures above. Sprinkle the enchiladas with the cheese and onion. If you decide to add the potatoes and carrots as a garnish: Peel potatoes and carrots, cut into cubes and boil until almost tender but still firm. Then drain and cool. Use the same frying pan where you fried the enchiladas to lightly fry the potatoes, adding a little more oil. The potatoes and carrots will be coated with some of the sauce sticking to the frying pan. Season with salt and garnish your delicious red enchiladas with cheese. If you enjoy this recipe for Red Enchiladas, please leave us a comment. 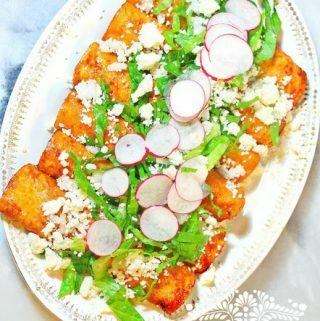 Enchiladas Rojas is one of those dishes that are cooked differently in every home. Each cook has his/her own recipe, so this is my own version based on my mom’s way of cooking them. In my hometown, it is common to have enchiladas for breakfast or brunch. 4 guajillo peppers seeds removed. 4 ancho peppers seeds removed. 2 cups of pre-cooked diced potatoes and 2 cups of pre-cook diced carrots. Let's start first with the enchilada sauce. Slightly roast the peppers in a hot griddle, pressing them flat with the help of a spatula. Make sure NOT to burn them. This step takes a few seconds on each side of the peppers. Once roasted, place them in a saucepan with water and turn the heat to medium and simmer for about 15 minutes or when they look soft. Remove saucepan from stove and let them cool for another 10-15 minutes. The pepper skins should look soft. After the resting period, drain the peppers and place in the blender along with the garlic cloves. Add 1/2 cup of clean water and blend until you have a smooth sauce. If necessary, strain the sauce into a large bowl using a fine strainer. Season with the oregano, salt, and pepper, and set aside. Preheat your oven to 350 degrees, just to keep the red enchiladas warm while you finish assembling them. Add the 2 tablespoons of vegetable oil in a large skillet over medium heat. Add oil little by little as needed. To much oil will get a soggy tortilla. Dip the tortilla into the enchilada sauce to lightly coat each side. Place it in the Frying Comal-pan or skillet and briefly fry a few seconds on both sides. Add more vegetable oil to the skillet as needed. Place fried tortillas in a dish while you make the rest of the tortillas to keep warm in the oven. To assemble the red enchiladas, first, place the filling in the center of the tortilla and fold it. Sometimes I place a meat filling into the center of the tortilla and then roll it, like in the pictures above. Sprinkle the enchiladas with the cheese and onion. Add the garnish of your choice and enjoy! Use the same frying pan where you fried the red enchiladas to lightly fry the potatoes, adding a little more oil. The potatoes and carrots will be coated with some of the sauce sticking to the frying pan. Season with salt and garnish with cheese. *This is my mother’s recipe. You can play around with the number of peppers, using more ancho peppers than guajillo or even making the sauce using just one of the peppers in the recipe until you find the taste that you and your family enjoy better. *My mom first dips the tortilla into the salsa and then fries them. It gets a little messy but the final result is worth the cleaning afterward. * Crumbled Fresh cheese is one of the traditional fillings. * The Sauce can be made one of two days ahead and also freezes well up to 2 months. Hi, I wanted to make the recipe version from San Luis Potosí, what changes in the chilies do I have to make? I can'tell wait to spend a weekend day with my daughter making this! I hate canned sauce so this looks perfect! I've read every word, now i'm ready to start cooking them, …right now. I want to make these tonight using ground beef. How should I season the beef? Sauteé in oil finely chopped onion and garlic, them add the ground beef. Season with salt and pepper. I just want to say, thank you, for not putting any tomato, tomato sauce, or tomato paste into your enchilada sauce! "Entomatadas(tomato sauce enchiladas)" are good, but I like to taste the chile's flavor. Your sauce is very similar to the one I make, and the only two differences in my red enchiladas and yours are that I first fry the tortilla in oil until it softens, and then I dip it into the chile, and second, I usually only put cheese in my red enchiladas unless I'm making a casserole and I then add ground beef. My sister-in-law makes hers like you do and even though she makes a big mess, they are so delicious! Thanks for your authentic recipe! Hi, do you ever add chocolate to these? I know there are some versions of red enchiladas with chocolate, they must taste really good. I will try next time. Can't wait to try your recipe and see if it taste like what Mom used to make. Will be adding the potatoes, chorizo, cheeses and sour cream on top. Thank you. The only way to do it is to dip in sauce then fry! You can use either corn or flour but I prefer corn. Just not the same kind of flavor unless you dip then fry. Must be something to do with caramelizing the sauce and they don’t get soggy that way. For convience’s sake, we always dipped our tortillas in hot oil first, then the chili. Less splatter😉 I look forward to making these; this is the type my family in Michoacan make. However, my mom always made “enchiladas estilo Sonorense,” they look like patties made with masa harina, fried, then dipped in chili. Immediately covered in cheese, then shredded lettuce. I’m drooling just thinking of them! Your mother “enchiladas” sounds indeed mouthwatering! Fried dough is delicious! I’ve made this recipe many times and I feel like I’ve finally perfected it! My entire family from my dad to my little sister are all great cooks and I feel like I can finally cook meals just as good as them with your help. Thank you for your amazing recipes! Thank you for trying the recipe for Red Enchiladas, And for coming back to leave a comment. Are these dried chilies in the recipe? Yes, they are dried peppers.